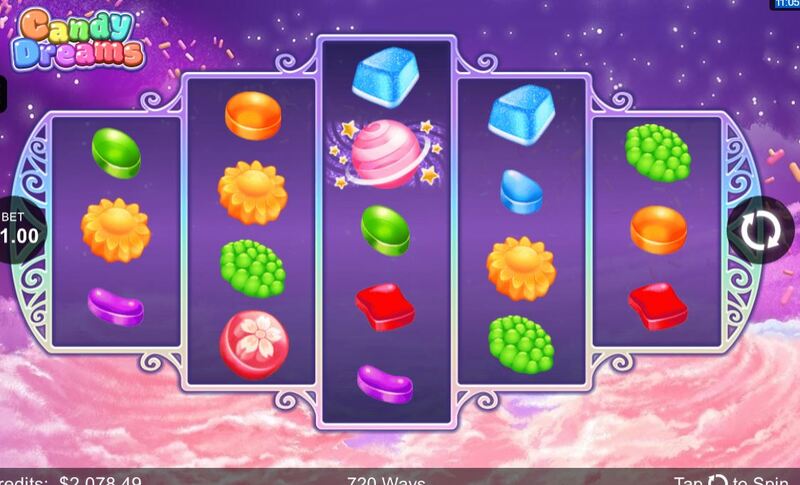 Candy Dreams slot needs no explanation as to its theme for the sweet toothed of us. It naturally features many childhood sweetshop favourites, which evidently Microgaming believe some would dream about. We presume this because the purple reels are set against a night time background of stars and fluffy candyfloss clouds and the reels spin with standard Microgaming spin and stop sounds. This actually surprised me as I was expecting a nursery rhyme soundtrack after looking at the game. So will Candy Dreams sweeten or sour your balance? Like IGT slots such as Hexbreaker 2, Siberian Storm and Netent's Wild Rockets we have the strange 5 reels of 3, 4, 5, 4 and 3 rows which results in a 720-way game. The symbols will thus pay little for 5-of-a-kinds with the stacked Candy Dreams Wilds on all reels paying a mere 10x bet for the 5, followed by 8 down to 0.8x bet for the remaining 9 icons which are all candies of different shapes and colours. These symbols are all single unlike the Wilds. You do get two different scatters though - the Candy Planet and the Rainbow Lolly which both appear on all reels and 3 of each anywhere will trigger the game's 2 bonus features. Candy Planet Picks - It is triggered when 3 Candy Planets appear and you are faced with 20 planets which will have cash values when chosen. You may pick the blue 'POP' sweet to end the bonus but if you select the Red Heart sweet first this awards an extra life. Wins are usually in the 10's x bet range. 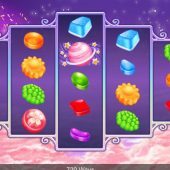 Free Spins - Landing 3 Rainbow Lollies anywhere awards 12 free games which can't be retriggered but come with a Gift Box on reel 3 which when appearing will throw 1 to 3 random Wilds onto the reels.